No matter where you are in the world, whether it be in the busy streets of Chicago or the sacred Maori shores of New Zealand, you will hear the locals tell a story of creation. And, almost every tale that describes the beginning of time and the beginning of this world, speaks about a giant flood that swept across the land, wiping out the bad and saving the good. 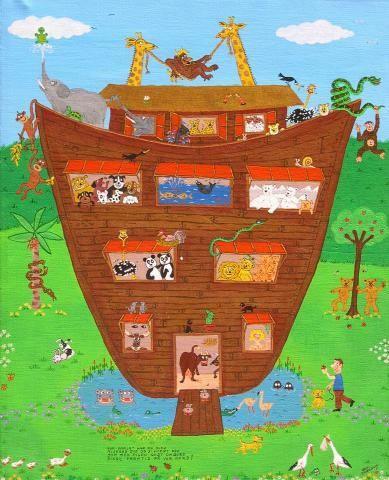 In ancient Judeo-Christian–Islamic scriptures, this good guy is known as Noah, and his ark is the reason why we are all here today. 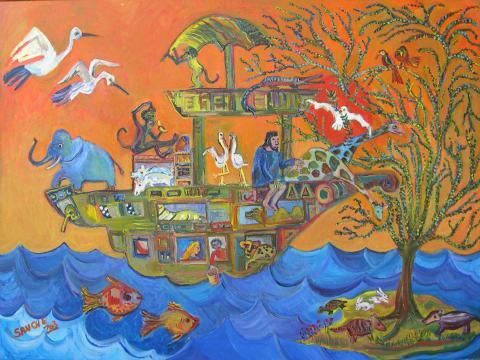 Noah’s story is so rich with adventure, animals, nature and life, that Naïve artists around the world have consistently chosen his story as the subject of their paintings. So many scenes of Noah and the flood have been painted, that the story can be pieced together through these paintings alone. 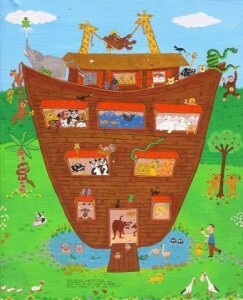 As the story goes, God said to Noah, “make for yourself an ark of gopher wood; you shall make the ark with rooms, and shall cover it inside and out with pitch… you shall make it with lower, second, and third decks.” So Noah built the ark making sure to follow the precise measurements and instructions. As you can see in many of these paintings, the animals are separated between compartments and floors. Then came the animals, two by two; birds, mammals reptiles and even ‘creepy crawly’ organisms. 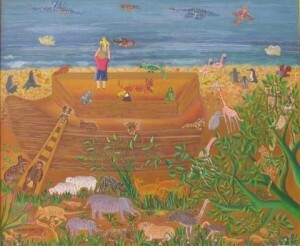 In this painting by Rodrigo Cuyo of Ecuador, you can see the preparation before the flood. Noah’s sons Shem, Ham and Jafet are ushering in the animals into the ark. The wives are busy gathering food and supplies that will be stored and eaten aboard the vessel. capybara.jpgAlthough all the paintings include colorful and diverse animals, it’s interesting to note that the animal species differ based on the geographic location of the artist. This Brazilian painting by Mabel Fernandes Machado, is jam packed with the native species that inhabit the terrain and rainforest of her South American country. Try and spot the capybara, armadillo and cheetah. If you look to the center you can see a toucan and green Macaw perched on the top deck of the ark, both native to Brazilian lands. As the vessel departs, everyone is in good spirits; In this painting by Horacio Sanchez of Argentina, a relaxed Noah hangs his feet off the side of the deck, as a festive party takes place all around him. Out the windows you can observe the water slowly consume every last bit of land, but everyone seems to be enjoying the view! The flood rages on for forty days and forty nights. Noah feeds the animals and ensures their safety and health. Finally, he sends out a dove who returns to the ark with an olive branch in its mouth. He therefore understands that the flood is over because it has found a suitable place to nest. It’s time to let out the animals and rejoice. If a picture is worth a thousand words, these paintings are worth a good story. 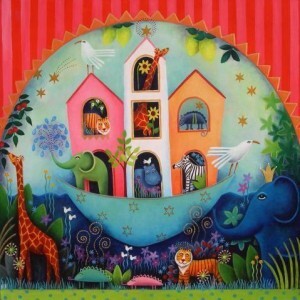 Naïve artists have once again succeeded in taking scenes of everyday life, in this case from the creation stories that we’ve learned, and transformed them into light, colorful innocent pieces of art. 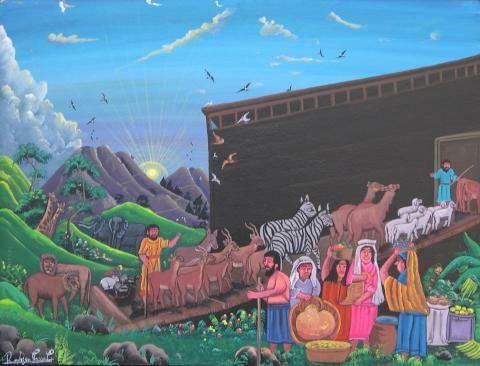 Check out more naive art Bible Scenes, like David and Goliath, Adam and Eve, King Solomon and many more paintings, throughtout the site! » Be My Valentine and get 15% off!